To roll out today’s new article, I’d like to break that down into an even more basic TWO types. Craig’s a laid back, roll with the punches kind of guy. While he’s appreciating each moment, I can be found spinning in Tazmanian Devil-like swirls of mental activity and physical productivity. 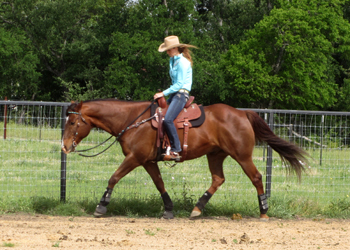 You can imagine why he’s actually a great match for his sensitive gelding, Dot Com (and ME). Craig operates with steady eddy-style energy that provides a lot of peace and reassurance for him. It’s great when everyone’s feeling relaxed and content, but the warm fuzzies tend to fade when we’re not progressive. That’s where my specialty comes in, which is crushing goals, blasting through obstacles and chasing dreams – full-steam ahead! My succeed or else style can be pretty intense, no doubt. In fact over the years I’ve had to learn to tone it down. And as you might expect, Craig has learned to liven up! I have a tendency to latch on to ideas like a dog on a bone, where Craig is slow to put a stake in any one belief. 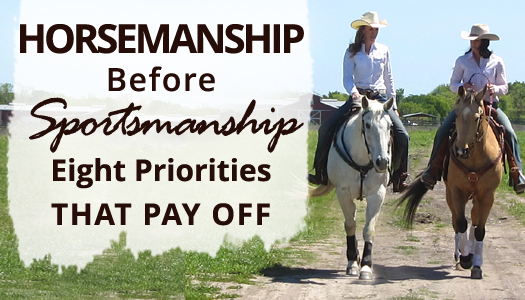 When it comes to caring for our horses and doing everything we can to bring out their best and achieve our barrel racing goals with them, I don’t think we can afford to sway too far either direction. It doesn’t matter what “style” WE are – we’ve GOT to do our homework to find our own “north star.” But having balance and perspective means we must be willing to let it burn out and focus on another guiding light instead, when appropriate. 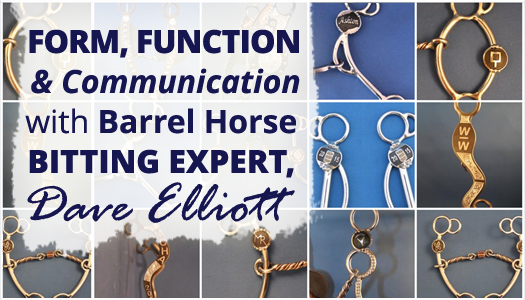 This month at BarrelRacingTips.com we’ll be diving into the subject “horsemanship for barrel racing.” Because quality horsemanship requires quality communication – quality horsemanship depends on quality tools! One of the most important being the bits we use to develop our barrel horses. It was easy for me to decide who I’d invite as a guest contributor on this topic. Dave Elliott, owner of Elliott Bit and Spur hails from Alberta, Canada and is a household name in the barrel racing industry. Although Dave himself rodeoed in the past, because his wife Louise is a barrel racer, it’s the discipline they’ve primarily focused on serving. Dave started out using horses on the ranch where he grew up, while his mother and sister rode english. Out of school he became involved in horseshoeing and did that professionally for 20 years. When business was slow in the winter time his interest turned to bit making, which he’s been doing on a full-time basis now for 25 years. on a bits inside, bottom right shank. 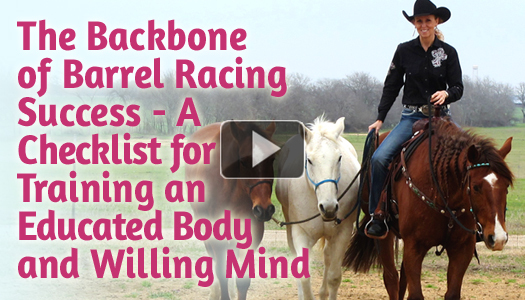 You may have figured out by now that barrel racing isn’t quite as simple as it looks. Speed especially, will throw us (and our horses) for a loop if we’re not careful. Ensuring they’re adequately prepared to perform their best on the pattern starts with understanding the elements of SPEED (which I went into great depth on here). It’s our responsibility as trainers and jockeys to not only be aware of our individual horses strengths and weaknesses but to embrace and take responsibility for enhancing their innate talents, as well as strengthening the weaker links. This doesn’t have so much to do with his physical ability, but his mental development – which is something I’m responsible for strengthening. You see, we have to be aware and advanced enough to realize that what WE might consider “sensitive,” could more accurately be described as REACTIVE, AND most importantly, could be turned into RESPONSIVE, IF we take the correct steps! I believe preschool teachers and colt starters should be among the highest trained and paid professionals in the world. I don’t think it’s an exaggeration to say that the future, not just the future of the horses and children they teach, but the future of the entire planet depends on quality early education. The human brain is thought to be most malleable between ages two and five. It’s not that you can’t teach an old dog (or horse or human) new tricks, but life is going to be a lot easier, safer and more successful and productive for everyone when youngsters of any species have positive learning experiences from the get go. 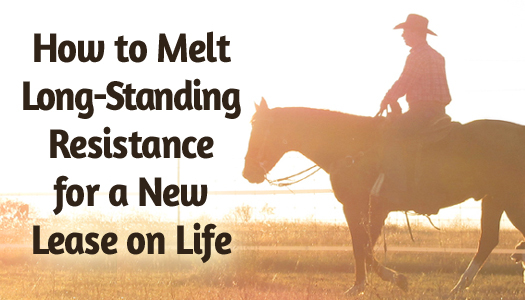 In the video below, I’ve gone through the critical foundational elements I believe are necessary to set a barrel horse up for outrageous and lasting success in life as a high end performance horse, and beyond. Because really, what they need in addition to discipline specific training is mental and emotional development, maturity and general life skills. Whether you’re working with youngsters or have an old campaigner, there are endless benefits to be gained through not only further refining your ability to influence a horse’s body effectively, but most importantly, their minds. Whether you call them patterns, exercises, or drills, there’s no denying they’re an important part of any barrel racers program. 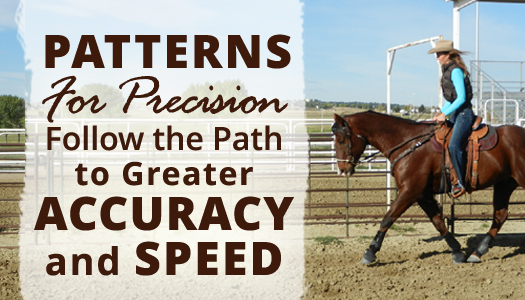 And it’s no wonder – high degrees of speed and precision are required to beat the clock, and our horses must not only understand their responsibilities for staying on track around the barrels, but also use their bodies in specific ways that put the odds most in our favor for efficiency and speed. 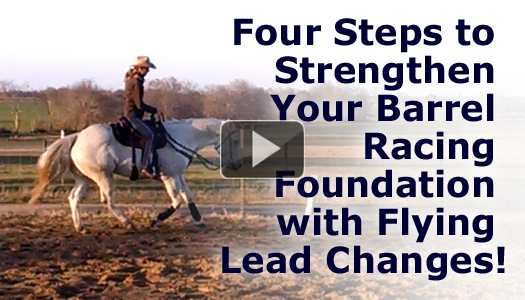 In The First 51 Barrel Racing Exercises to Develop a Champion, I went into great depth explaining the power of patterns and WHY they are so important based on how our horse’s minds are wired. I also included the specific ways we can use patterns to achieve even more positive results. The truth is, we can perform drills until we (and our horses) are blue in the face, but if we don’t use psychology as we apply them, we won’t get nearly as far. https://www.barrelracingtips.com/wp-content/uploads/2018/06/barrelracingtips.png 0 0 Heather Smith https://www.barrelracingtips.com/wp-content/uploads/2018/06/barrelracingtips.png Heather Smith2014-12-09 01:00:282018-09-09 00:33:40Patterns for Precision – Follow the Path to Greater Accuracy and SPEED!